"It was a refreshing pleasure to listen to your succinct and piercing clarity in yesterday's webinar." "My colleagues and I enjoyed it together and celebrated the day that nurses as well as the rest of the world get to learn the important message you have for us! And the help we need so very much! "Loved the seminar….In fact I can’t wait to have enough data to start plotting. For someone like me to feel any confidence in working in this way is very exciting! " 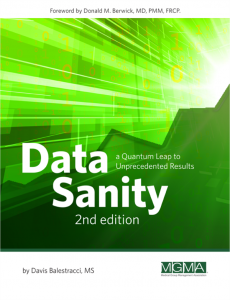 "I think you should expand the seminar title: perhaps “Data Sanity and Successful Leadership” I don’t think most of us expected such an emphasis on leadership and the human factor, but it was certainly an essential component that I think most of us found inspiring and encouraging. It’s heartwarming to experience a business professional who finds a way to bring such healing (and workable/productive) concepts to the business of reporting and making $ for our organizations."